B.: Type of hunting practised? F.F. 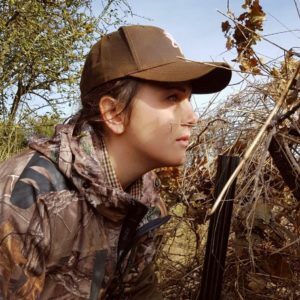 : Small game (wood pigeon, duck, pheasant, partridge, woodcock, hare…) and big game (wild boar, roe deer, red deer…) by driven hunt or stalking hunt. F.F. : I have my license since November 2015. But I have been at the hunt with my dad sometimes when I was young. F.F. : I have always loved the wild and I have always admired animals. In 2014, I accompanied my dad, my brother and my uncle during a driven hunt (small game and big game). I had a really great time during this day with beautiful memories… But there isn’t female at hunt… So, I said to myself: “why couldn’t I do it?”. I discussed it with my family and my grandmother said to me “If you have your hunting license, I give you a shotgun which belonged to your grandfather.” So, I got my hunting license and my story started from there. I was not thinking that I can be addicted as I am. I have a deep respect for the wild and for the animals. The wild is incredibly beautiful… I feel myself nearer to the wild since I hunt. F.F. : I have two: in the French mountains to hunt mouflon by stalking and in Saskatchewan (Canada) to hunt a whitetail deer during a snowing day.